Akdamar Church situated on an island in Lake Van is a popular tourist destination. 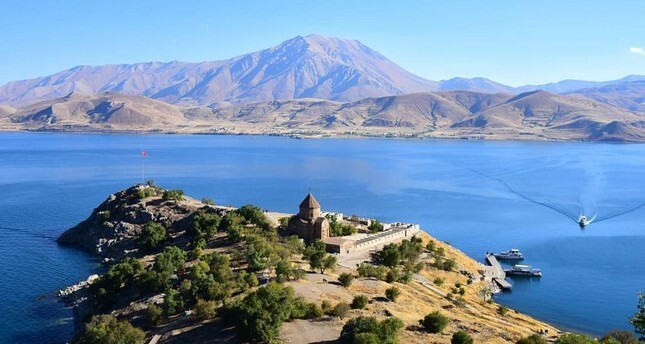 Akdamar Church, located on the eponymous island in Lake Van in eastern Turkey, will host its first international religious ceremony in four years after the annual event was scrapped due to security concerns. The Armenian Patriarchate based in Istanbul will organize the event which is expected to attract hundreds of Christians from around Turkey and the world. The Culture and Tourism Ministry and local authorities gave the green light for the event to held on Sept. 9. The church is open to visitors as a museum but crowded events were barred as acts of terrorism escalated in Turkey's east and southeast where the terrorist group PKK was active. After a brief lull, the PKK, which has conducted a campaign of terror in the region since the 1980s, resumed its attacks in 2015. Counterterrorism operations since have reinstated safety in the region, which is dotted with prominent sites for Christianity and Islam. Travel agencies and hotels in the Van province where the lake is located have seen a substantial increase in bookings while local businesses are counting on faith tourism dollars. Muzaffer Aktuğ, head of Van's state-run culture and tourism directorate, says the event is important to promote Van to tourists. "We are pleased that the event was allowed again. We have all the preparations in place to host our guests in the best way," Aktuğ told Anadolu Agency (AA). "The church is a significant historic and cultural legacy for Van and attracts a growing number of tourists," he said. Murat Beyaz, who owns a tourism business in Van, says the event is a big gain for Van. "There won't be a tourism boom but it is a good development [in terms of] showing that the region is back to normal," he said, referring to counterterrorism operations. Beyaz says that apart from the religious visitors, tourists were also interested in the church and visit the place out of curiosity. "I hope this religious service will not be interrupted any more. We also expect restoration of other Armenian churches and monasteries in Van so that more visitors will come here and make Van one of the hubs of faith tourism in Turkey," he said. Added to the UNESCO Tentative List of World Heritage in 2015, the church was built between 915 and 921 A.D. by architect Bishop Manuel, under the supervision of Gagik I Artsruni, an Armenian king. Believed to be constructed to house a piece of the "True Cross," which was used in the crucifixion of Jesus Christ, the church was restored in 2005 and opened in 2007. The Ministry of Culture and Tourism approved a 4 billion lira (around $3 billion in 2005) budget for the project, which lasted two years and included several architects, engineers and archaeologists. The church has been hosting annual international religious ceremonies organized by the Armenian Patriarchate of Istanbul once a year since 2010. Offering visitors the chance for a refreshing swim along its beaches, the island also features walking routes adorned with almond trees and spectacular sightseeing opportunities during sunset. The island was visited by about 83,000 tourists between January and July. Authorities recently launched a water supply project to transport drinking water to the island in a bid to attract more visitors. A pipeline 33,000 meters long will be constructed for the project which aims to keep the island lush and green all year round.